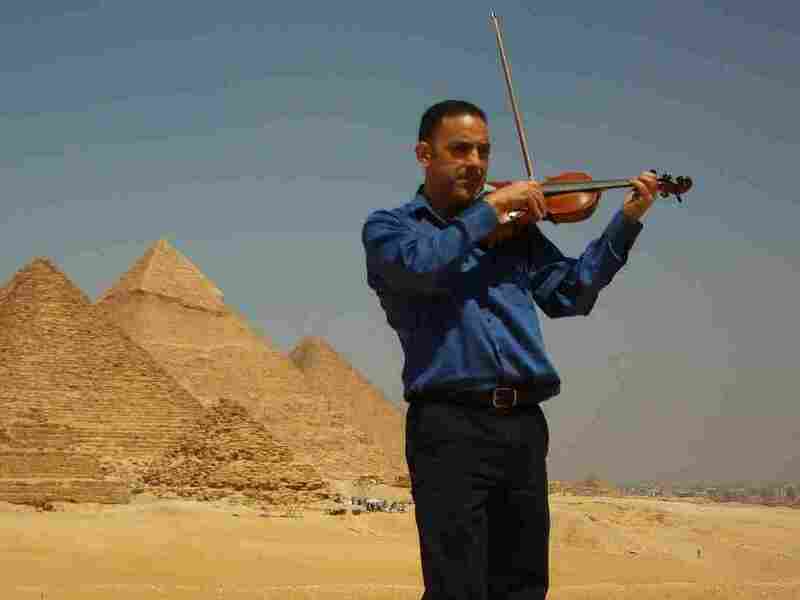 Riad Abdel-Gawad creates new Sufi music by translating sacred chants to the violin. Sufism is the mystical path of Islam. It is the inner, meditative branch of the religion that's found in many different forms, in many different countries, and seldom makes news like its Sunni and Shiite counterparts. The ancient spiritual practice of Sufism incorporates all kinds of activities to achieve a state in which the practitioner loses the ego and experiences God through singing, chanting, reciting, whirling — as in dervishes — and music. Riad Abdel-Gawad, a noted Egyptian-American Sufi violinist who has come to Studio B at NPR West to play some of his compositions, lifts his violin to his chin, closes his eyes and inclines toward the microphone. The music that comes out of his instrument is insistent, exotic and transporting. With a Harvard Ph.D. in composition, the Cairo-born virtuoso has played and taught his music around the world. Abdel-Gawad's compositions embrace Egypt's multihued, 7,000-year musical history, which he's updated with a New World sensibility. He plays a fast, repetitive figure. "We call this zikra lela," Abdel-Gawad says. "It means the remembrance of God. So you can use the music as a means to transport yourself to different stages and closeness to Allah, or God." Sufism in America became popular in the 1970s, when it migrated here from the Middle East. People gather in small groups, in homes or lodges, to inquire, meditate and listen as they approach the disciplined life of a Sufi. The sect does not advertise or proselytize. Kabir Helminski is a 65-year-old American Sufi author, lecturer and spiritual leader who runs sufism.org. He's also a whirler in the Turkish Mevlevi Order. "Sufism is a spiritual path that people choose to have an experience of the divine," Helminski says in a phone interview from his home in Louisville, Ky. "There's quite a variety of music, but the important thing is that it happens within a sacred context, and music is there to take people to a very sublime and transcendent state." Riad Abdel-Gawad is best known for his made-in-the-USA compositions that expand Egyptian classical music. Along the way, he creates new Sufi music by translating sacred chants to the violin. "This is religious or sacred music," says Abdel-Gawad, "a little bit like Bach's time when he had music for the church. Similarly, now we have concert music that's growing out of this sacred Islamic music." Through this work, he's ensuring that the ancient practice of Sufism has a modern soundtrack.